Strengthen your high-speed network with Tripp Lite's N235-001-SH-6A Cat6a Straight-Through Modular Shielded In-Line Snap-In Coupler. 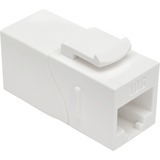 It connects two Cat6a patch cords to create one longer cable, and its keystone design is perfect for convenient feed-through patching when used with a standard data wallplate(such as Tripp Lite's N042-001-WH). 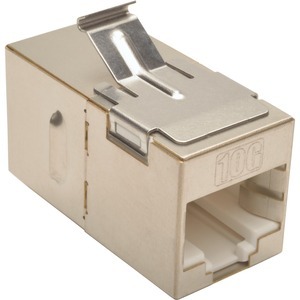 Built for ultra-fast performance, this is an ideal coupler when setting up premise wiring, telecommunications, data networking and Ethernet connections. Compatible with all Cat6a cables, regardless of what size wire they use, the N235-001-SH-6A's protective metal housing is fully shielded to reduce EMI/RFI interference that can damage or degrade data. This coupler features straight-through wiring and 50-µinch gold-plated contacts designed to resist corrosion. The N235-001-SH-6A is UL-listed and meets all requirements for EIA/TIA Category 6A compliance. 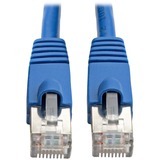 It's also backward compatible with Cat6, Cat5e and Cat5 LANs.